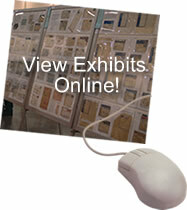 We have educational courses to help you learn to exhibit. Our show calendar will help you identify events where you can exhibit. Our Judging Manual is available for download and provides the criteria which the judges must use in evaluating an exhibit. And lists of the award winners of national level shows are also available. Chapter Activities Committee - list of online exhibits. Although some may view philately as a solitary hobby, it is no different than most sports in that it provides a similar opportunity for competition and the ability to show off your skills. 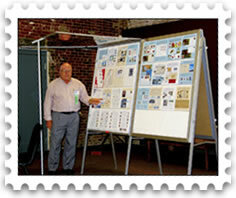 An exhibit is a way of telling a story using stamps, covers, and other related items. It may be the story of a single stamp, a set of stamps, some aspect of a country’s postal service, or even your favorite subject completely unrelated to stamp collecting illustrated using philatelic material. Just like a sport, development of a high caliber exhibit requires an understanding of the rules and strategy to showcase a portion of one’s collection. The successful exhibitor needs to demonstrate knowledge as well as exhibit a high degree of difficulty by showing hard to obtain (but not necessarily expensive) items. As you work your way up in sports you also can work your way up in exhibiting from the local or regional show, to a national (in the United States often referred to as a World Series of Philately show), or an international (FIP show). Most shows have a series of rules (the exhibit prospectus) and require an application to enter. And you may be required to obtain a certain level of award before moving up to the next level.